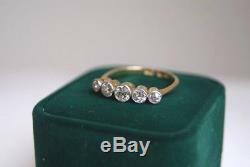 A FINE ANTIQUE EDWARDIAN 18 CARAT YELLOW GOLD AND PLATINUM FIVE STONE OLD CUT DIAMOND HALF HOOP RING IN VINTAGE FITTED RING CASE. THIS IS A BEAUTIFUL RING WHICH WOULD MAKE A LOVELY ENGAGEMENT RING FEATURING FIVE WELL MATCHED GRADUATING ROUND OLD CUT DIAMONDS EACH SET IN AN 18 CARAT YELLOW GOLD MOUNT WITH A PLATINUM MILLE GRAIN SURROUND. 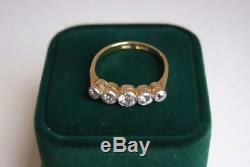 THE SHANK OF THE RING IS ALSO IN 18 CARAT YELLOW GOLD AND THE RING IS IN VERY GOOD CONDITION. 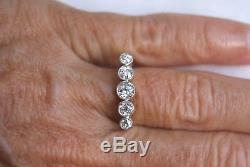 IN THE OPINION OF OUR GEMOLOGIST THE DIAMOND CLARITY IS SI 1. 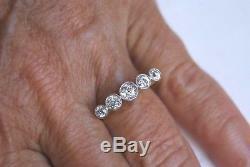 IN THE OPINION OF OUR GEMOLOGIST THE DIAMOND COLOUR IS APPROXIMATELY G/H. THE DIAMONDS HAVE AN APPROXIMATE TOTAL CARAT WEIGHT OF 0.75 CT. CENTRE OLD CUT DIAMOND APPROXIMATELY - 0.25 CARAT. TWO OLD CUT DIAMONDS FLANKING CENTRE DIAMOND EACH APPROXIMATELY - 0.15 CT TOTALLING 0.30 CT. TWO OUTER OLD CUT DIAMONDS APPROXIMATELY EACH - 0.10 CT TOTALLING 0.20 CT. ACCOMPANIED BY A VINTAGE TOOLED LEATHER FITTED RING CASE AS SEEN IN IMAGE ELEVEN. 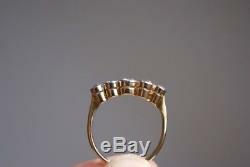 RING WEIGHT - 3.1 GRAMS. 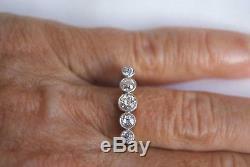 APPROXIMATE RING SPREAD ACROSS THE STONES - 2.0 CMS. 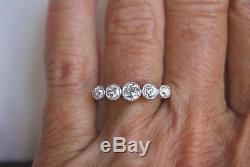 UK RING SIZE - O 1/2. 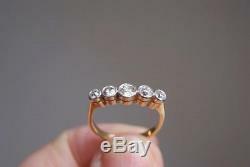 US RING SIZE - 7 1/2. SUITABLE FOR RE SIZING IF REQUIRED. 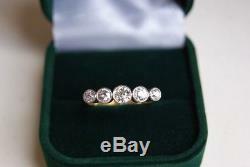 DIAMONDS APPROXIMATELY - 0.75 TCW. STAMPED 18 CT & PLAT INSIDE OF SHANK FOR 18 CARAT GOLD AND PLATINUM. 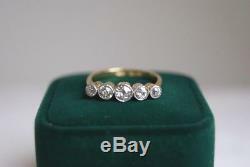 THE RING HAS BEEN LIGHTLY CLEANED AND IS PRESENTED IN VERY GOOD CONDITION. 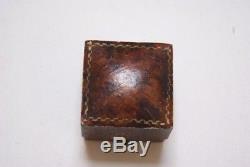 ACCOMPANIED BY A VINTAGE TOOLED LEATHER FITTED RING CASE WITH PUSH IN BUTTON STYLE OPENING. I CURRENTLY HAVE SOME VERY NICE ITEMS LISTED AND WILL CONTINUE TO ADD TO THE LISTINGS INDEFINITELY. PLEASE NOTE THAT WE DO NOT KEEP OUR STOCK ON SITE. 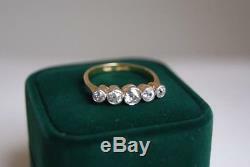 The item "ANTIQUE EDWARDIAN 18CT GOLD & PLAT 0.75CT OLD CUT FIVE STONE DIAMOND RING 3.1G" is in sale since Sunday, September 9, 2018. This item is in the category "Jewellery & Watches\Vintage & Antique Jewellery\Vintage Fine Jewellery\Edwardian (1901-1910)". The seller is "lapsangpainting" and is located in London. This item can be shipped to all countries in Europe, all countries in continental Asia, United States, Canada, Australia.